Over the past year or so, our insiders within FCA have been telling us about the pending arrival of a Dodge Charger SRT Hellcat and it appears as though that arrival could be very soon. Pictures, a video and an informational graphic have surfaced online over the course of the past week, leading us to believe that it won’t be long before the wider Hellcat sedan makes its official debut. 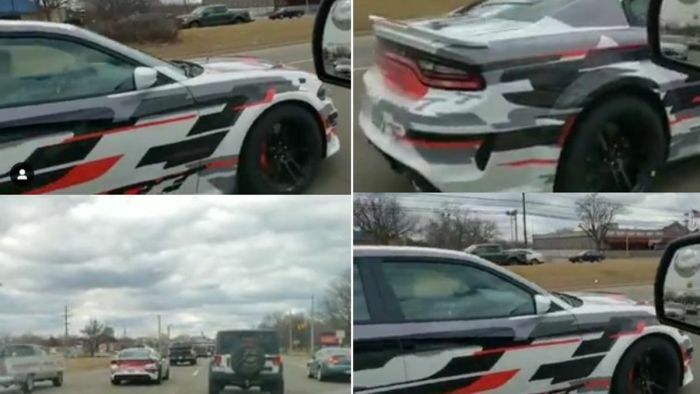 According to our friends at Allpar, pictures of what appear to be Hellcat Charger Widebody test cars clad in unique SRT camouflage turned up online over the weekend, along with what appears to be an FCA graphic detailing the features of the widened muscle sedan. Those pictures were followed by video of one of these cars cruising through traffic in Metro Detroit and that video has been met with messages from a handful of other people who have seen these cars (it could be the same car, but we know that there is more than one that looks exactly like this). Looks good. Hopefully they will offer the Redeye package at the same time for the Charger.